Sometimes a very special canine finds us, in perfect synchronicity. You may have experienced losing someone close. The next thing you know, you’re leaving the shelter, with unconditional love at the end of a leash, aptly named Passion. Your intention was to save a life, but it didn’t take long to realize: YOUR life changed for the better, that day. Neighbors were moving and the furry senior member of their family was not welcome. “We’re taking her to the pound, unless you know someone.” The words still sting your ears, but you love the dog and accept (gritting your teeth) how some people so easily detach themselves. You have a reason to get up in the morning, because that grateful dog thinks: “My human is AMAZING!” Daily walks and outings result in new friends, increased health, and an abundance of joy, smiles and love. In my favorite dog book, “Merle’s Door” by Ted Kerasote, an affable golden-colored dog appears as Ted’s about to embark on a rafting excursion. “You need a dog, and I’m it,” Merle spoke with his eyes. Ted did not return home from that trip alone. The sweet lab mix ingratiated himself into Ted’s life, and the entire town’s. Dogs give unconditional love while reminding us: There is only this moment. They enhance human lives tremendously. Like Merle, Brownie just showed up one day, circa 1939, in Daytona Beach, Florida. He quickly became a goodwill ambassador, a furry town attraction, and a true local celebrity. Brownie’s annual dog tag was always the number one. He kept secrets and befriended those waiting for a bus or cab. Brownie accompanied police on nightly vigils, checking on downtown businesses. Brownie reveled in visiting with children in the park, and had his own bank account. His main hangout and address of his custom doghouse was the Daytona Cab Company. I recently visited Daytona’s Halifax Historical Society Museum, and met the delightful museum director. Ms. Fayn LeVeille grew up in Daytona, and knew Brownie. She and her brother would look forward to going downtown to visit with the big tan dog. Accidents and illness are unplanned, but they occur daily. As difficult as it is to make “those plans,” as a responsible human being, we owe that to all members of our family. More often than you know, pets are displaced, due to our lack of planning. Can you imagine how confusing and devastating that must be for them? They end up in shelters, abandoned or worse. This is the case with 65-pound, senior hound mix Passion. Her owner died suddenly, leaving several Chihuahuas and three large dogs homeless, without any plan. Everyone except Passion has been adopted. She might not ever be as famous as Merle or Brownie, but she has love and years to give. We can all certainly use more PASSION (especially the canine variety) – for a reason, a season, and a lifetime. 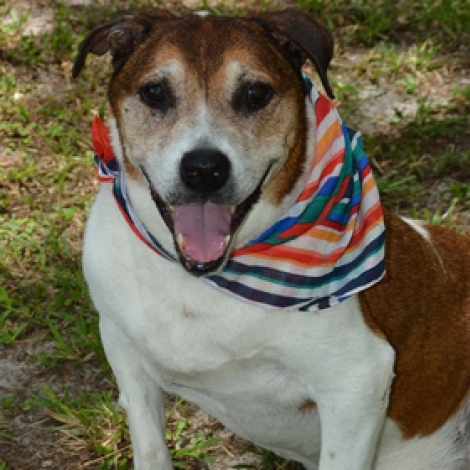 Passion awaits her next family at Southeast Volusia Humane Society in New Smyrna Beach.